Is Tesla a LeBron James or a Kwame Brown? I am an admitted basketball junkie. I watch 20-25 games a week during college basketball season. Every summer, when the NBA draft is approaching, fans, scouts, and analysts start evaluating players. One word that you hear a lot is potential. You hear comments like, “he has a lot of potential” and “there is no limit on his potential”. And every year teams select players based on their potential over more proven players. Sometimes it works out and sometimes it doesn’t. LeBron James was a phenom in high school and was drafted first overall in 2003. I would say LeBron has lived up to his potential considering he is in the conversation for greatest player of all time. Just two years earlier, Kwame Brown was drafted first overall in 2001. Brown played for seven different over 12 seasons and averaged 6.6 points and 5.5 rebounds for his career. Needless to say, Brown did not live up to his potential. With all of the hype about Tesla possibly being taken private, I started thinking about the stock and how it is like an NBA prospect, it has potential. I love the idea of using solar power to generate the energy needed to run a manufacturing facility. I love the idea of totally electric cars that are also stylish. 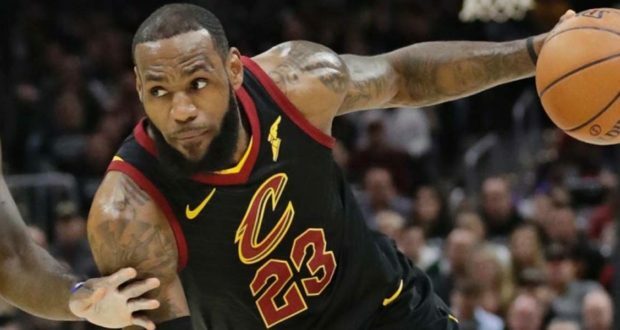 So far, Tesla’s stock price has shot up like it was putting up big numbers like LeBron James, but in reality the company’s fundamental performance has been more like the numbers put up by Kwame Brown. Tesla was founded in 2003 and went public in 2010. The stock traded between $16 and $38 from 2010 to 2012. 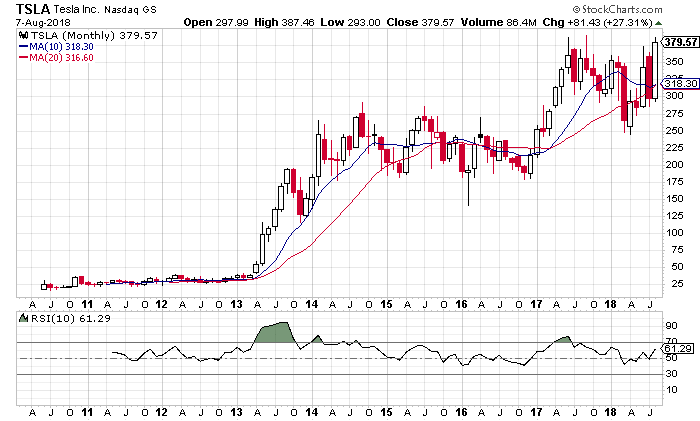 In 2013, the stock really ramped up, jumping from $34 to as high as $193. I even wrote a bullish article on the stock back in March of ’13. I saw the potential in the stock and the sentiment toward the stock was extremely bearish. Here we are five years after the stock started its meteoric rise and the stock is now up at $380. In the meantime, the company has produced a profit in one quarter—the third quarter of ’16. In the most recent quarterly report that was released last week, the company lost $2.45 per share. In the quarter before that it lost $3.35 per share, before that $3.05 per share… You see the ongoing theme. I know a number of other people in my industry are very bullish on Tesla, but I personally don’t see how it is worth $380 when it keeps losing money. I think Elon Musk is brilliant, I am not questioning that. I also think he is probably on the Autism Spectrum based on his constant outbursts that reflect difficulties with social norms. I understand Autism as I have a son on the spectrum and he too is socially awkward. As far as the stock though, I don’t get it. I have an approach to evaluating stocks where I look at the fundamentals, the sentiment, and the technical analysis. Yes the chart shows incredible upside momentum, but the fundamentals are awful. I use Investor’s Business Daily’s EPS rating and SMR rating as a quick snapshot of a company’s fundamental strength. Tesla receives a 2 on the EPS rating and a D on the SMR rating. The lowest EPS score you can get is 1 and the lowest SMR rating you can get is an E. Those two grades make Tesla one of the weakest publicly traded stocks from a fundamental perspective. The sentiment toward Tesla used to be extremely bearish, but not anymore. When I wrote the bullish article on the stock back in 2013, the short interest ratio was around 15 if I remember correctly. Today that ratio is at 3.62. The short interest ratio measures the number of shares sold short divided by the average daily trading volume. The higher the number—the more bearish the sentiment. If Tesla was a biotech firm on the cusp of a breakthrough to cure cancer or diabetes, I could understand the hype. A breakthrough like that could make the company profitable almost immediately. But that isn’t going to happen with Tesla. Even building a plant in China isn’t going to shoot sales up to the point that the company is profitable the quarter after the plant is complete. When Musk announced via Twitter that he is considering taking the company private, the stock immediately shot up. While from his personal perspective I can see the appeal of going private, but that isn’t going to solve the company’s problems. Sure, he want have to have those pesky earnings calls anymore, but it won’t help the company make money any sooner. Personally, I will sit this one out. I won’t buy the stock and I won’t short it either. It is a stock that I just don’t get and that has never worked out for me in the past.